On an outback tour in 2008 in Australia, we were driving from El Questro on the Gibb River Road in Kimberley to Purnululu National Park. It’s an extremely long drive. It was an extremely hot day. Everything happened in slow motion. Everyone moved slowly. Everything took forever. Aircon wasn’t working in the truck. My boiling brain was constantly calculating our location and our ETA, the deadline being sunset at 5pm in Purnululu National Park. As time froze on the never-ending bitumen road going South, I was getting very restless and frustrated. The sky was fantastic, some spectacular otherworldly cloud formations adding to my frustrations. This sunset would be out of this world and we would surely not make it to Purnululu in time. When we finally hit the 54km dirt road leading into Purnululu National Park it was after 3pm. It was my second time to Purnululu and I knew it is about a 2½ hour drive to get through the 54km quite poor dirt road – at least. Sunset was around 5.15pm. Simple math told me to give up; resign. We would not make it. We would have to stop on the way and enjoy the sunset from the road, I should start scouting for alternative locations along the way into Purnululu. I remember being so frustrated I zoned out listening to my ipod. Imagine my surprise when we pull up at the ranger station at 4.45pm. We had made it in about 1 hour and 40 minutes! I switch into a shooting mode frenzy! “Nick” I shout at our driver, “Nick, mate, get everyone back on board, we’re 5 minutes from the Kungkalahayi lookout, we can make it we can make it!”. Make it we did. Shoot many photos I did. All good things to those who wait! I raced up the hill and had a 360 degree view from the Kungkalahayi lookout of an absolutely magical sunset that had me smiling and talking all night after capturing countless images. This is a stitched panorama. I can’t make up my mind whether the ‘sun beaming into a f/22 aperture’ works. There are also quite a few different colours in one shot and a slightly busy composition. But it’s a wonderful scene and there is a lesson in here somewhere I suspect. Something about patience. Landscape Photography is all about waiting; waiting for that special moment with the magical light. Never give up. Things may look like a no-shot day but the sun can change that in a split second. Always be ready. I seem to get worse at waiting though. But when everything looks grim but ultimately works out beautifully like this day; the restless impatient me at least provides me with some good laughs afterwards. All good things to those who wait! 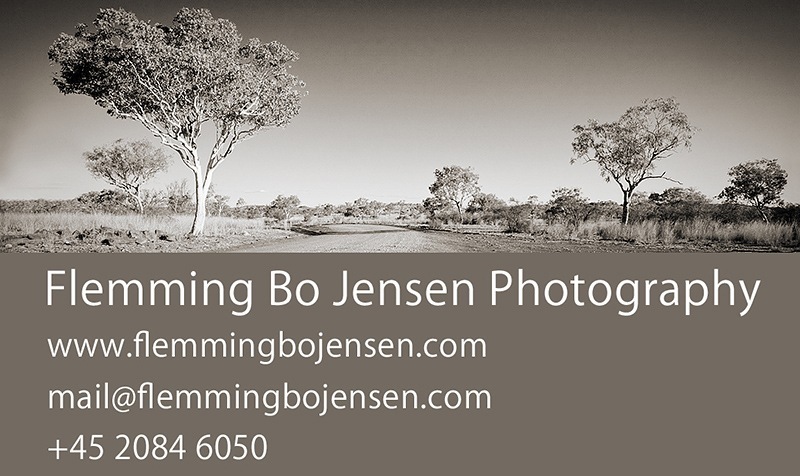 It is exciting times to be running a photography business as there are so many online printing services enabling you to put your photos on just about everything. Last week I blogged about my book, this week I feature my new custom double sided business cards – with a Moooooo twist! 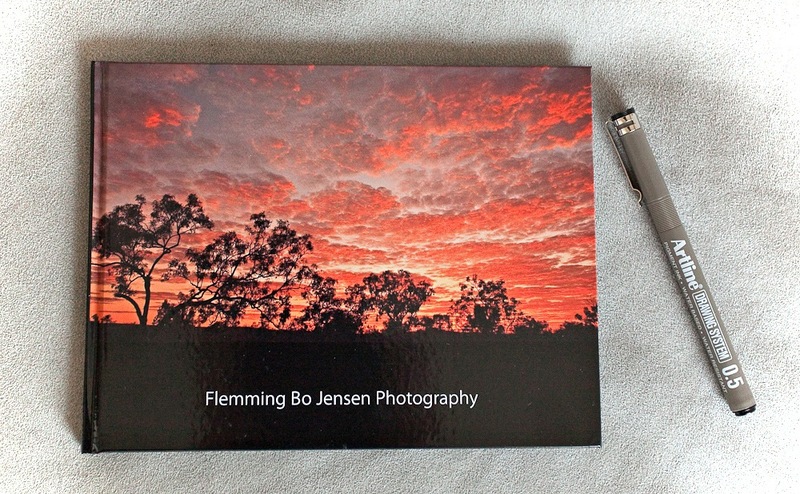 Click the photo below to see large size – that is my recently published photo book! Fresh off the press! My book! Pictures don’t lie do they? …so what if it is just me publishing me – I still had a book published! I find while travelling and shooting that people I meet are always very interested in seeing my work; last time I decided that I should bring some sort of mini portfolio with me and might even make some sales that way. So I simply used one of the online ‘create your own photobook’ services to print a compact portfolio book for travelling. 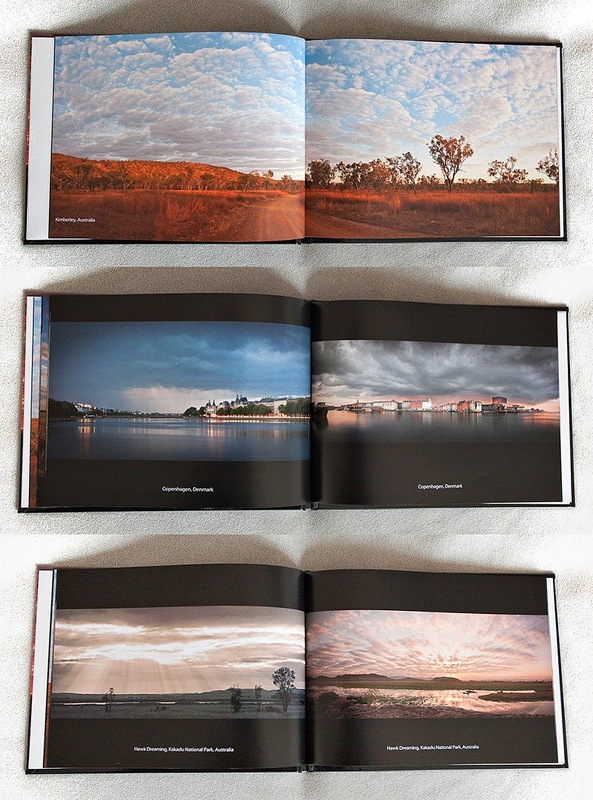 I used the company MyPhotoBook as I had read great things about them and they offered a small 15×20 size book, perfect for travelling. Blurb.com is another service getting good reviews, but they didn’t have the compact book I wanted. See photo on the right for some sample pages (and why I’ll never make a living doing product photography. I couldn’t light a scene to safe my life, I depend on the sun). Print quality is actually quite good and the paper is very nice. Quite heavy paper with a nice semi-gloss finish. Colours are spot-on, for 4-colour press printing I am actually very impressed by how accurate the colours are. The prints could be sharper though, perhaps due to the small size of the photos. My book! Even though it’s me publishing me it’s still rather nice to browse my own book! Certainly inspires me to print a much larger book – and one day see my books in a bookshop with customers queuing round the block! Hey it could happen. Well, I can dream anyway! Photographers, backup and protect your data! A year ago I wrote an article about backing up your data and I reckon it’s time for an update and for my tips on backing up and protecting your precious data = photos! All digital photographers need to realize that photos are now just binary data on a hard drive waiting to blow up! 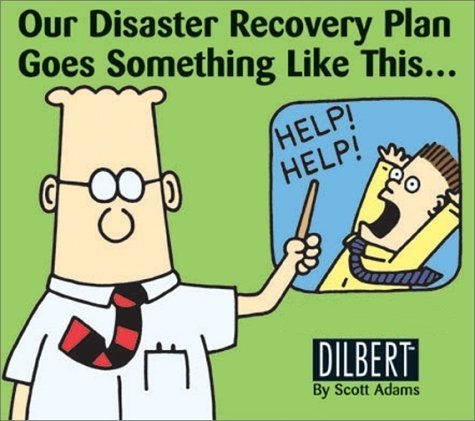 A backup strategy is needed now, before your computer or hard drive crashes! So read on and save your work! “Hallou hoe gaan dit?” is Afrikaans for “hello how are you?”. Learning a bit of Afrikaans and dusting off my German language skills are just two of the many things I have on my to-do list before my next photography odyssey which, in exactly two months time from now, sees me embark for the magical deserts of Namibia, as seen in this David Attenborough narrated BBC video. 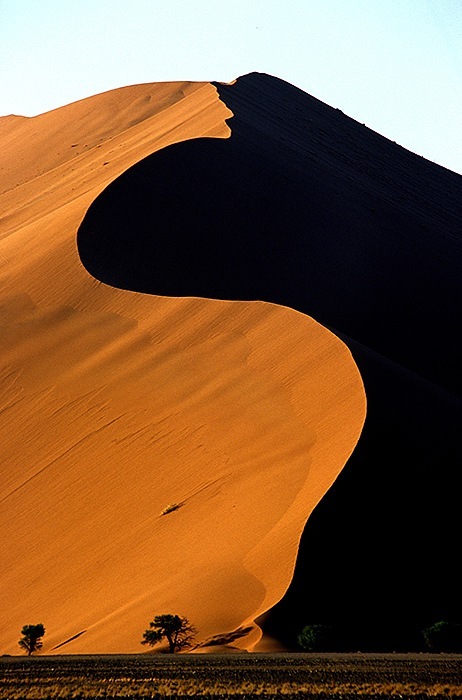 Namibia is mostly desert and extremely dry. Home to the world’s oldest desert with the world’s largest sand dunes and the least people (least densely populated country in the world). It appears to be the perfect conditions for me and I am seriously concerned already about becoming obsessed with two continents! After Namibia I am jumping across the Indian Ocean to be part of a photo tour (if it runs, if enough people book) in Kimberley, Western Australia, and the route Denmark-Namibia-Australia is not the easiest nor cheapest to fly! This will be the first serious road test of my Canon 5D Mk II and I look forward to capturing 21 megapixel desert shots day and night! I am fortunate to be staying with a Namibian friend and family in the town of Swakopmund, right on the coast and next to the dunes. My favourite science fiction book is Dune and I will be working on my ‘Fremen’ skills every day as I capture my own version of Dune. See ya’ in the desert and “totsiens!” (means goodbye). T minus 58 days.